No, this is not your usual celebrity commitment. This is a lasting joint effort to help places like Houston. Boxing legend Evander Holyfield teams up with Cryptonomex and Arise Bank to raise a billion dollars for humanitarian disaster recovery. Together they will raise a million dollars for the cause and then grow it to a billion dollar endowment by promoting growth in AriseCoin and BitShares in the difficult months to come as Houston, Miami and San Juan rebuild with the technology of BitShares AriseBank and hero’s like Evander. Evander will ask other celebrities to Accept the Challenge and join the fight in an upcoming event in Atlanta. We are sneak previewing it here for the benefit of our most loyal supporters. Consider it an "informational share drop". 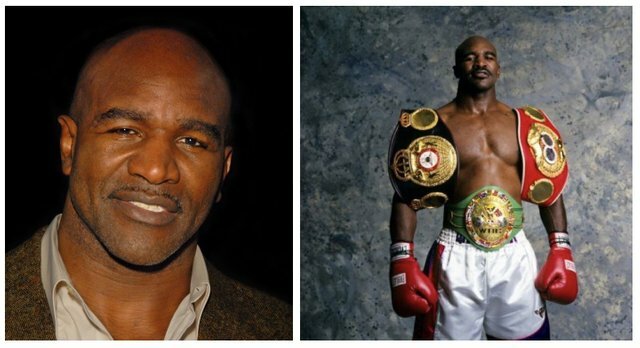 Evander will also be announcing other athletes and celebrities joining the biggest fight in history, in a separate event which is sure to have cross-promotional benefits for all parties, including the Steemit community where breaking news on this initiative will appear frequently. Excellent @stan! Love Evander too! Let's hope a competing crypto does not hire Mike Tyson. Oh, that's inevitable, unless bitshares snaps him up first and launches a "bitshEARs" campaign!! Think of the possibilities!! This is marketing magic! Do you think you'll be making more interviews like these in the future? I'm loving all of it. You're awesome and a great step-up for the community. Top quality content! You're so kind. I love your appreciation. I don't know why it made me feel warm fuzzies inside. This community is great. Love to you and everyone. Love the interviews Connie, keep up the great work. Thank you @matthewwarn, I appreciate that. Aaaaaaa I didn't know you could post gifs. This is so great! Do you just copy and post Gifs ? IT IS! Isn't it? Best thing that happened today, it really made me smile. I'm sure he will. This stuff is so great quality that I'm sure that the fluffs and puffs will put him up with the greatest minds in the world. Evander is actually the only boxer who never feared Tyson from the hype of the media. I'm glad i got to see this message. Shoutout Steemteam! @shazi935 click for click i will click on your blog. Even I am expecting same form you . Great fan of Evander & the fighters in the day. Will keep my eyes peeled & see how it goes. This has been a helpful tool following the trends. I couldn't resist...I wish I had !!! Me too, lol. His movies are so funny. Every time I think of him I remember how awesome China is. I hope they overcome their communism! How to earn money in STEEMIT Please tell me the actual thing!!!! Just don't remind him of that if you ever meet him in person. Frustration cannot be controlled when what you do easily turns hard. Holyfield was a good challenger.... i love the man. Let's keep John McAfee far away from Bitshares! Right choice! I’m in Bts for long term as well! Congratulations Evander and @stan ! Appreciate the edit and the humility! Great job Stan! Wow, you weren't joking when you said you were going to be dropping some big names for the Hero Campaign! I have a question, where do I go to see my free tokens from sharing about the campaign on social media? Any word on when the announcement event in Atlanta will be? I'd be interested in attending. This is a great decision from the legend for a greater cause. Thank you so much @stan for making Bitshares growth faster than everyone expectations. 2018 will be an amazyng year for bitshares! Wow this is totally awesome news, great post and I hope they raise it and above. I have not looked deeper into bitshares yet ... but it is definitely one of the tasks I have to do! Anyone can win BitShares Billion Hero Challenge. So great! What a feel good post and I love me some Evander! wow steady a sturdy youth in thinking limp body well and body healthy, legendary mike tyson three defeats the unforgettable concrete neck. Great to hear! A legend aboard BitShares ... Happy New Year! Is this the best way to contribute/add value to a post about Bitshares and humanitarian efforts? PLZ consider a downvote for spam and to much selfupvote. Pity Bitshares decided that people outside of US and Europe are not important. Yes, I have seen the statements about it being global. No, seeing these statements and claims it did not help. Yes, I publicly reported my problem at least 3 times. No, it never caused anyone to help me. I guess Google, the caring BitShares community and the blockchain are all my friends. Awesome venture and great cause! Hi @stan ! i want to know how to make an interesting post and look good? a joint venture that should definitely be supported.I wish everyone was so thoughtful,the world has become a better place.. Does he still have an ear!??? "...not your usual celebrity endorsement". I like Evander and I like the cause but lets not forget that he is definitely getting paid for doing this. It is an endorsement. When I read this article my mind immediately goes to, I wonder what the administration costs are for this endowment. Don't get me wrong, I understand this is for a great cause and from my knowledge, Evander is a great guy. Lets just not give him angel wings for making a business deal. Btw, Great post and information! Woww, that's something lokk good, did BTS hit $1? I had a chance to meet Holyfield a few years back. He is a stand up guy. I love starting my New Years with good news. Wow, this is great! I saw the updated Bitshares State of the Network post and was like, what is this? Guys, if you haven't worked it out already - AriseBank + Arisecoin is a total 100% scam. Just google AriseBank scam and spend 10 minutes of research (especially if you have any thoughts whatsoever of actually investing in their ICO). You can also simply google 'jared rice and stanley ford' to read about Jared Rice's pat scams - Jared Rice is the guy behind Arise Bank. If, despite all the evidence, it's not a scam, I'd love to see @stan or someone illustrate why - all I've seen so far in response to various posts highlighting the clear evidence that it's a scam is more FUD (or simply downvoting it appears). Wishing him the best in his quest to raise a billion dollars, this is a quest for a good cause and my prayers is with him. I love it when big name atheletes and star lend their name and personalities to causes like this. It shows they're still people and care for others. 😂😂😂 Bit(ear)shares... Tyson joins monero? congrats for those who bought bitshares in a very early period!! So anyone can win this. Great! This is amazing the Blockchain can really change the world ! Yeah, look at Dash, they're using the miner's ASIC power to help all around the world. Truly incredible.